There’s more than a whiff of Harrison Ford in the Copeland Story. In his early years he was whisked away from his UK birthplace on the Isle of Sheppey in Kent, not yet six months old, to Burma, where his father was a Shipping Pilot on the Rangoon River. Phew!… it gets better. Once there he contracted a tropical lurgie in the hip, which laid him low, in a wooden splint, for six months. Welcome to Rangoon! Unable to return to England, because of the war, it was arranged through friends that he would be sent to Hobart (Hear that Harrison? Rangoon to Hobart Town!). They went by Qantas Flying Boat, which did not fly at night. It took them ten days! Needing a change, he went back to England with a mate and found himself in 1957–58 attending the famous London School of Printing. The experience was a revelation. For the first time in his life he really learned something about modern graphic design. 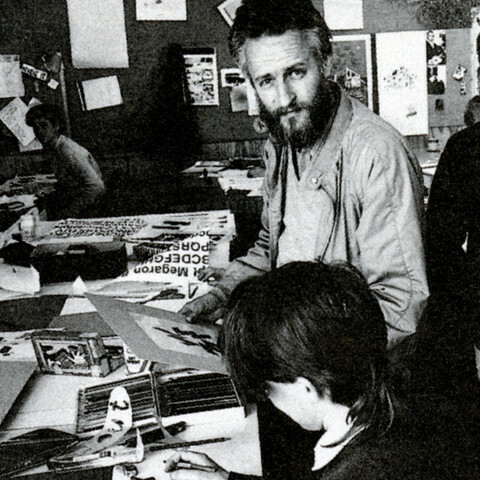 His teachers included Tom Eckersley (brilliant poster designer), Derek Birdsall (Partner in Omnific, designer of the celebrated Olivetti Calendar), Donald Smith and Australian Keith Cunningham. Back in Australia in 1958 he joined the staff of the World Record Club under Art Director Geoff Digby. In those days it was booming, and with Digby’s encouragement he designed some superb record covers. Who could forget the pomp and power of his Regimental Guards series compared to the sheer delicacy of the Leonid Kogan cover for the Mozart and Prokofiev Violin Concertos. He enjoyed working beside talents like David Leonard, Guus van der Heyde, Malcolm Binding; who wouldn’t? But by 1962 he could feel it changing. He noticed cost cutting, time constraints and “outside” freelancers being used less and less. He spotted an ad for a lecturer in “Advertising Art” at the South Australian School of Art in Adelaide. In typical Copeland style he travelled from Melbourne to Adelaide by P&O Liner for the interview, where, despite his lack of enthusiasm for teaching Roman Lettering (much loved by the Education Department) he got the job, and finished up teaching Roman Lettering anyway. He loved this job. “When they did good work, I got a fantastic feeling of satisfaction. When they were lazy I sometimes felt like tearing my hair out.” He taught for many years, inspired many young people to become top Graphic Designers and retired finally into the arms of a loving family and admirers. The Indiana Jones of the Indian Ink Bottle had come to rest. This text marked the induction of John Copeland into the AGDA Hall of Fame in 2014.